It’s been a while since I’ve seen any live theater in DC. The last show I saw was “Looped” over 5 years ago, yikes! Not so great for someone who actually was a theater geek himself once upon a time. So when an opportunity to attend some of this year’s Capital Fringe shows1 presented itself, I was intrigued… and mostly excited. Note: I’m a day late getting to this post, the festival started yesterday and tickets are on sale now. So if you’re interested in a show, get on that. 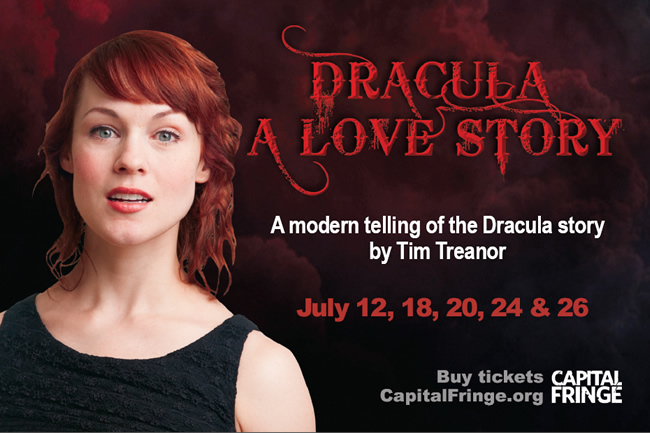 Dracula, street name Vlad Tepes, is alive and flourishing in Washington, DC. The ancient predator feels right at home among K Street lobbyists. For dinner, he can dine on any of the fresh kills provided by his butler Renfield. Awash in a field of plenty, Dracula has one problem: his beloved bride, Mina, is dying and his sights are set on Lucy, a beautiful but bored graduate student. Written by: Tim Treanor. Directed by: Christopher Henley and Jay Hardee. Running time is about 90 minutes and it’s at Mountain – Mount Vernon United Methodist Church, 900 Massachusetts Ave NW. July 24 at 8:15pm and July 26 at 10:45pm. Tickets available online and at the venue. 1 As PRESS, no less! 2 Coincidentally, the movie I watched on my first real† date. † Y’know, with a man. Only Gyllenhall and Ledger are allow to hug!